!!! My website has moved: please update your bookmarks to debunix.net !!! Crisp and thin, for eating with cheese, soup, or just by themselves (if you like crackers as much as I do, they're hard to stop eating). You can see an illustrated primer on making crackers here. Whisk or sift together the dry ingredients. Stir in the oil until the mixture is uniformly crumbly. Starting with about 1/4 C, stir in water until the mixture just holds together enough for rolling out. You may need another couple of tablespoons of water to reach rolling consistency. On a floured board, roll 1/3 of the dough about 1/16" thick. Sprinkle lightly with salt, and go over once with the rolling pin to fix the salt to the crackers. Prick the dough with a fork all over. Use a pastry roller or sharp knife to cut the dough into about 2" squares. Place the squares (and the funny edge pieces, too) on ungreased baking sheets and bake until the edges are golden (about 10' in preheated oven). You'll most likely have a few that will bake faster; don't be afraid to pull the sheet out of the oven, scoop the done ones off, and quickly return the rest to the heat. The secret to maximum, uniform crispness is to bake them twice, like biscotti. Bake them until they turn golden brown, but remove them from the over before they get darker brown. You can leave them on the baking tray, or transfer them to cooling racks; for this purpose it doesn't matter. Bake the entire batch this way. When they're all finished, turn the oven temp down to 150-175 degrees, and when it has cooled down to this point (check first! ), return all the crackers to the oven. You can scatter them over a single backing sheet, and don't worry if they overlap a bit. You're going to leave them in long enough that it won't matter. Check them after an hour or so, and if even the thicker ones seem nicely crisp,, then turn the heat off and leave them in there until they're completely cool. Store them carefully to maintain that wonderful crispness; I find I eat them up so quickly that they don't have a chance to get soft or stale. 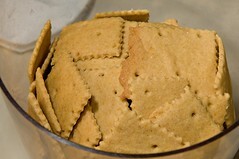 *The rice or rice flour adds crispness, but you can get a nice cracker using all a mix of wheat plus corn flours.